A few of my Americade buddies wished me a happy birthday on the Cybercaders forum the other day, which got me thinking of Americade, my favorite rally. I searched my hard drive and found this pic, which includes a couple of my well-wishers. 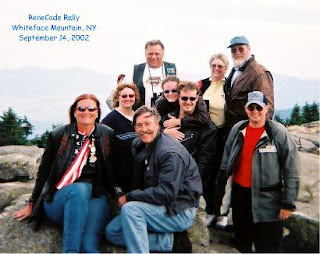 This was shot atop Whiteface Mountain in September 2002 during the inaugural "official unofficial Americade event" dubbed ReneCade. We had an awesome ride that day in the northern Adirondaks, including a lunch stop and walking tour in Lake Placid. I'm the doofus in the red T-shirt. We knew who the Doofus was, roflmbo!! !